Designing products for load bearing applications can pose a multitude of challenges, so it’s important for a designer to have a “toolbox” of techniques that improve design quality. Designing for stiffness through geometric controls is a top tool in that box. Even the simplest designs can be sensitive to part stiffness: For example, if a plastic coat hanger is too flimsy even to hold a shirt or a pair of pants without sagging so much that the clothing falls off or wrinkles, then it’s not worth much. This is why a plastic coat hanger has a much larger diameter than a metal hanger. Neither design will come close to the material's yield strength, but the item’s function depends on the stiffness of the design. This article is part one of a two-part series that walks through different methods for increasing part stiffness. Here in Part One, we’ll focus on changing the geometry of structures to increase stiffness. The overall concept of increasing stiffness in this manner is pretty simple, but the formulas may look daunting at first. This will be especially true if you don’t use them on a regular basis. The following sections will walk through this process to help clarify the math. When I say we’re going to increase stiffness using a geometric approach, I really just mean that we’re going to make a part stiffer with dimensional and/or shape changes. This may be as simple as increasing the diameter of a rod or as complex as adding gussets to certain bosses. A feature’s shape and size impact the formulas required to calculate stiffness, so we’ll consider those geometric properties first. As you might imagine, some shapes will perform better in some load cases than others, and some parts will need to be bigger to accommodate higher loads. In this article, we will focus on relatively simple shapes for the main examples, and I’ll touch on some complex shapes towards the end. The first shapes that we’ll use as an example are round bars and tubes. For these shapes, the dimensions we need to consider are the outer diameter, the inner diameter (if we’re looking at a tube), and the length. The images below illustrate the dimensions about which we care the most. If we’re looking at rectangular bars, the dimensions of concern are a little different. We need to know the base, the height, and the length of the feature, as indicated below. Continue reading to understand why these dimensions are so important! We know which dimensions are important, and we know that shape and size impact stiffness, but how big of an impact does it actually have? This is the basic problem we’ll be solving today! We’ll walk through a mathematical approach to determining exactly how much a shape or size change will affect our stiffness. Beam Deflection – This formula is used to calculate the total deflection we’ll encounter in a beam when a load is applied. For our example, we’ll look at cantilever beams, but it’s important to keep in mind that there are many different formulas based on the load case, and I encourage you to research them. Beam Stiffness – This formula defines how resistant a beam is to deflection under a given load. As beam stiffness increases, deflection under loading decreases. This formula is based on the beam deflection formulas, as you’ll see below. Area Moment of Inertia (Area MOI) – This formula takes into account the geometry of our beam and is used to solve our deflection and stiffness formulas. There are only a few formulas required to solve for stiffness, but each geometry and load case may have a different formula. Stay tuned to learn exactly how these formulas change. Our first formula defines the deflection of a cantilever beam with a load at one end. The image below illustrates what this means. In this article, we’ll solve for both stiffness and deflection, just to demonstrate how they correlate (if the derivation hasn’t sold you already!). The final formula we need to know for our analysis is the Area Moment of Inertia (Area MOI). This formula is the heart of our geometric control method because it incorporates the exact dimensions and shapes we’ll be modifying. First, let’s revisit our tube below. In this example, the Area MOI is the same about both axes, but with shapes like rectangles, that’s not always the case. The best way to understand which moment of inertia to consider is to think about applying a load—around which axis will the bar rotate or wrap? As an example, if we place a load parallel to the Y axis in the example above, we’ll try to rotate the bar around the X axis. That means we’ll need to consider the Area MOI about the X axis. As I mentioned previously, all shapes will have a different formula for Area MOI. The images below detail a solid rod and a rectangular rod with their associated formulas. I’ve also created a quick calculator that will allow you to play with these geometries to get a better feel for the impact of shape and size changes. There’s even a tab for stiffness and deflection that will allow you to estimate the deflection if you don’t have an FEA program. Download our Excel tool to easily calculate Area MOI, deflection, and stiffness. Our calculator predicts that the beam will deflect 0.144” at the end, which sounds like a pretty reasonable number. Let’s see what we get if we actually run this assembly through an FEA study. Here, we can see that we got about 0.163” of deflection at the end. This correlates pretty closely between the two different approaches, so we’re happy with this. The differences may be a result of the deflection spreadsheet approximating the interaction at the base, as well as small calculation margins combined between the FEA and generalized deflection equation. Next, I want to stiffen this assembly. 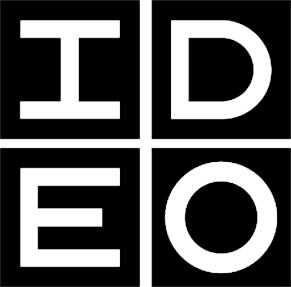 I’ll do this by increasing the OD to 2.0” and the ID to 1.5”. In doing so, I get the following Area MOI. We have only increased the OD by 33%, but the Area MOI has increased by about 170%. Hopefully, this conveys the message that seemingly small increases in part diameter or height will greatly increase the stiffness. Now, let’s run the calculations for stiffness and deflection. This time, we can see that the stiffness has also increased by 170%, and deflection has demonstrated an inversely proportionate relationship. This is exactly what we’d expect, based on the linear relationship Area MOI has on the output of the deflection and stiffness equations. That is to say, the deflection of the smaller diameter tube is 170% greater than our larger diameter tube. Now, let’s jump over to an FEA study that looks at our 2.0” OD by 1.5” ID cantilever tube and compare the result, as shown below. We can see that the deflection is 0.0646”, which is pretty close to our spreadsheet calculations again. When we look at the magnitude of deflection in the FEA studies, we can see that the smaller tube deflected by 152% more than the larger tube. Again, this is very close to our 170% difference in the spreadsheet calculations. Another interesting detail worth noting is the stiffness performance of the tube as compared to solid bar stock. While the tube contains less material and consequently mass, it can be designed to have almost the same stiffness as a similarly sized solid bar. Let’s look at our calculator again to run some quick calculations between a round tube and a solid round bar. 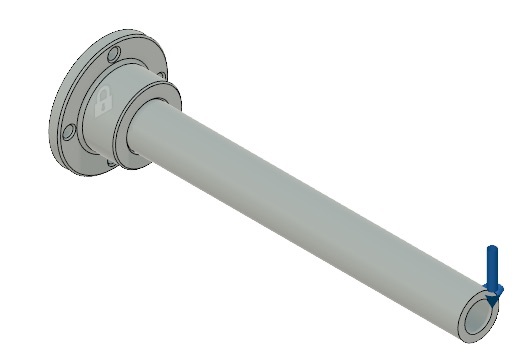 The first calculation we’ll run is going to look at a 2” round tube with a 1” bore through the middle. 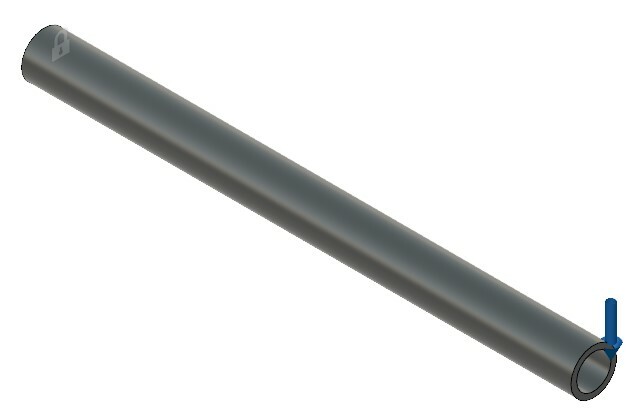 We will compare this with a 2” solid round bar, as shown below. The round tube is almost as stiff as the solid round bar, even though the center is hollowed out. This is useful if we need to save weight and/or material. Obviously, a hollow tube will weigh much less than a solid bar, and the reduction in material will equate to savings. If we need the stiffness to be about the same, we do not have to add much to the outer diameter. We have matched our original stiffness after adding just 0.030” to the outer diameter, while keeping the 1” internal diameter for our tube stock. These principles work for any other shape of solid bar and tube stock, as well. There are some other methods for determining stiffness, Area MOI, and Deflection. Obviously, an FEA study is the first that comes to mind for all of those. 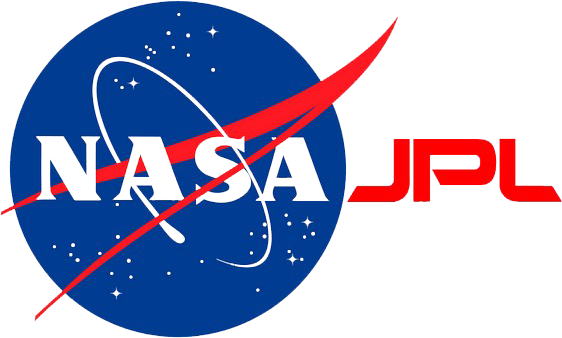 However, we may not always have a license available for a good FEA program. If that is the case, we can often get the Area MOI from our CAD program. Both Solidworks and CREO/ProE have this function. This is especially useful when we are looking at complex geometries. As an example, we will look at a boss with gussets (below) similar to what I described in a previous article. You can see that the boss is not simply a cylinder but includes gussets that make it a little harder to calculate the Area MOI. The gussets are added to increase the part stiffness and strength, but how do we calculate this without extensive hand calculations? 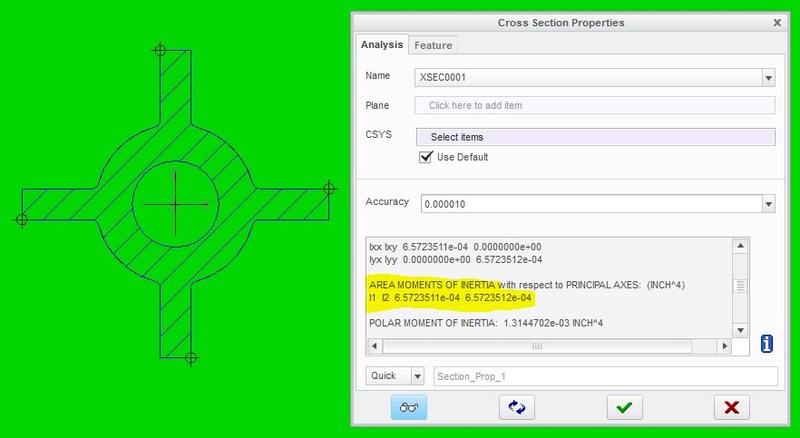 The answer is to look at the section properties in your CAD program to determine the Area MOI. The image below details this method. Now, we can quantify the exact increase in stiffness achieved by this modification, based on these measurements. 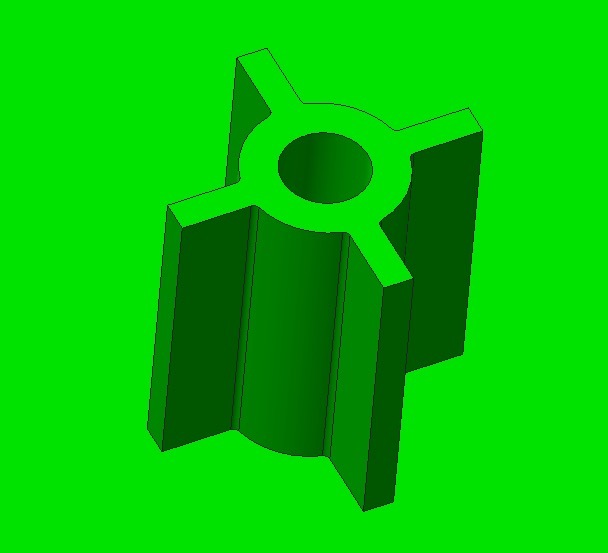 We’ve walked through the basic principles of designing for stiffness using a geometric approach and have outlined exactly how to achieve the goal of stiffer parts, for higher quality designs. 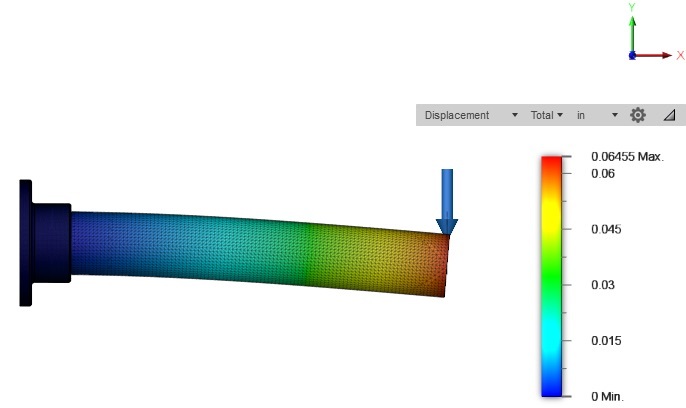 Stay tuned for Part Two of this series, where we’ll discuss increasing stiffness by changing material properties. In the meantime check out Fictiv's Capabilities Guide to get ideas for your next project.